It can be safe to assume that we all have used a smartphone at one point or another in our lives, in addition to owning one. Thanks to Apple’s super effective marketing strategy, we were also persuaded to jump aboard the tablet bandwagon, which also cannibalized into the netbook market which was originally thought to be the next big thing since sliced bread. Well, since so many of us now also are in possession of a tablet device, be it running on Android or iOS, the third party accessories market has also exploded in a big way. With so many players in the market, how does one tell what is good quality or not from the other? Satechi is a name that has been trusted by many for a long time now, and their latest release will target those who own smartphones and tablets – in the form of the Satechi SCH-121 Cup Holder Mount. 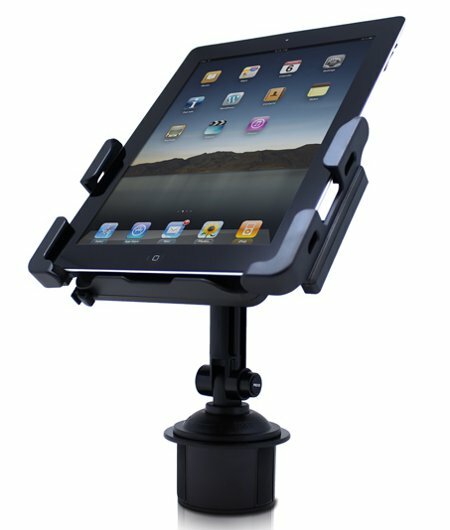 Not only is it user friendly, the Satechi SCH-121 Cup Holder Mount is also convenient to use as well, as it delivers a non-obtrusive solution for safer hands-free calling and navigation – as long as your tablet is no smaller than 7″ and no larger than 10″, while most modern smartphones ought to play with it nice without any hiccups whatsoever. Two cradles will be able to hold both devices depending on which one you want to use at the moment, where the tablet cradle enables stable and secure mounting with full access to all buttons and functions on any tablet, while the case-friendly smartphone cradle will ensure your iPhone or Android device fits in perfectly without being tossed about when you turn a sharp corner at full throttle. As for the SCH-121 Cup Holder Mount’s flexibility, its cradles are able to rotate 360 degrees so that the tablet or smartphone can be adjusted to resemble landscape or portrait mode. The hinges on the mount can be rotated up to 180 degrees for vertical or horizontal height adjustment. Not only that, there is an expandable base that makes sure it can drop in nicely into any size cup holder. If you travel a whole lot and use your smartphone or tablet as a GPS system, then the $29.99 Satechi SCH-121 Cup Holder Mount would make a decent purchase.